The Thesis: The volutionary process is a continual flow and exchange between more gross and subtle levels of manifestation. It is holographic in its nature. Chapter 3 looked at the polarity that is set up when there is awareness from life of an unmet possibility and an impulse to fill that niche. The tension between the polarities forms the relational field of potential within which a response to that need can co-creatively emerge. This section focuses on the process that takes place between those poles in that field of potential, the Dynamics of the Trinity. There are three main aspects that this section will focus on: the surface of the field that is created and held by the polarity (the Container), the geometry of the structure as a whole and the dynamics that go on inside of the entity bounded by the surface, between the poles. This is what I call the holographic breath. Some cosmologists believe that what we experience as three-dimensional space (and four-dimensional spacetime), may actually be a holographic projection emanating from a two-dimensional boundary termed a brane. (Currivan 2005, 69). The volution thesis proposes that the life process is more adequately seen as holographic, meaning that information is stored on the surface brane of an entity (created by the initial impulse and polarity) and that coherent light from the unified field streams throughthat surface and literally in-forms the dynamic process of differentiation and interconnection that gives rise to the denser forms of reality that we can perceive. Figure 8 illustrates how the process of imprinting an image onto a holographic plate works. A laser beam of coherent unified light is split into two beams (duality and polarity) one of which passes via the original object (information) and the other of which is reflected directly onto the holographic plate where it meets the Object beam to create the image (Talbot 1991, 15). The brane surface can be seen as a two-dimensional field and its function has been described elsewhere by others researching information fields. Rupert Sheldrake (1981) describes what he calls morphogenetic fields as fields which hold memories from the past creating patterns which influence probability in the present and future, relating to collectives (e.g. species of plants and animals, or groupings of people). These fields “are responsible for the characteristic form and organization of systems at all levels of complexity” and “affect subsequent similar systems by a cumulative influence that acts across both space and time” (p. 3). This can be seen as another description of the brane of the torus. A torus is essentially a rolled up finite surface or brane, that holds the information. Talbot (1991) is describing a similar thing when he lays out physicist David Bohm’s notion “that as the present enfolds and becomes part of the past, it does not cease to exist, but simply returns to the cosmic storehouse of the implicate” (200). The idea of our perceived reality actually being a projection of a more fundamental reality has an earlier expression in Plato’s Republic, where he uses the allegory of a dark cave with projections on the back wall of the cave being caused by sunlight streaming in and creating multiple moving shadows. The people in the cave mistake the shadows as the reality and forget to look to the source of the shadows as more fundamental. We tend to see the visible world as all there is whereas a holographic perspective suggests it may be a projection of information stored at a more fundamental level of reality, on the surface of a torus bubble. In The Wave (164-166), Currivan describes the function of membranes as holders of information. Membranes are likewise surfaces that bound an organism. The size of a surface membrane determines how much information a particular organism can hold and handle, for example a “cell’s ability to handle information is proportional to the surface area of the membrane” (164). The relative amount of information it can hold impacts its ability to survive which is related to the nature of its dynamic relationship with its environment and its perception of that environment. The more information that is held on the membrane the more informed the perception of the entity and therefore the more effective it is in engaging with its environment and therefore surviving. The evolution of multicellular organisms for example creates a bigger membrane that transcends and includes the cellular membranes. It is indeed the electrical activity in the epidermis, which is the outer layer of the skin membrane, that initiates the regeneration of the physical body - the place where the blueprint information is stored (216). The continual expansion of membranes in this way relates to a principle first described by Arthur Koestler and later developed by Ken Wilber (1995), that of holons and holarchies. Wilber states that reality is composed fundamentally of holons, “wholes that are simultaneously parts of other wholes, with no upward or downward limit” (35). Holons exist in holarchies, where “as a more encompassing stage or holon emerges, it includes the capacities and patterns and functions of the previous stage (i.e. of the previous holons), and then adds its own unique (and more encompassing) capacities” (20). This matches Currivan’s description of the evolution of cell membranes and the brains of vertebrate creatures (166). The nonlinear emergence of a new holarchical level membrane happens when there are "a sufficient number of connections between the individual chemical compounds, or nodes, comprising the looping network of catalysis" (168) - so once the current holon membrane has reached a certain stage of integration and coherence. If, as Wilber suggests, this holarchical pattern that can be seen in membranes and the human brain in fact describes the nature of all entities in a relative differentiated world, then we can see how the holographic principle of a surface brane plays out at every new holonic level of a holarchy. As a new level of holon emerges, it transcends yet includes previous levels, expanding its embrace and surface area, and thus its holographic ability to hold more information and deal with greater complexity - increasing complexity and differentiation/integration being core to the directionality of holarchic development (Wilber 1995, 67-68). Currivan (2017) describes it in this way: “additional, explicit, and transient information is characteristically present just before emergence itself and, crucially, involves an informational dialogue among the pre-emergent entity, its subsystems, and its larger milieu”. In Chapter 5 we will explore more the characteristics of holons and holarchies. For now we continue to focus on the macro-dynamics of volution as expressed through the toroidal form. The torus is one shape that satisfies current cosmological evidence for the design of life. Currivan (2017, 102-104) references recent scientific research suggesting that our Universe may have a toroidal form. At the Wisdom University Geometrica intensive in Chartres 2011, I was exposed for the first time to the geometry of the torus. In particular a moving image of Buckminster Fuller’s “jitterbug” seemed to pull it all together in what looked very much like a breathing process. Soon after that an online course on Cosmometry helped to fill in more details (Merry 2012). So far we have looked at the role of the surface of the torus, and will look after this section at the flow of the torus. To connect the two we will now look at the geometric structure of the torus. Given that everything emerges out of the unified field, as explored above, the first geometric aspect to look at is what the geometry of that unified field might be. Buckminster Fuller (Edmondson 2009) identified it as what he called the “Vector Equilibrium”, “the zero point for happenings or nonhappenings: it is the empty theater and empty circus and empty Universe ready to accommodate any act and any audience” (Fuller 1975). This equilibrium is ready at any moment to come intomovement and create form. This reflects Currivan’s first law of information, where information is expressed non-entropically as energy-matter outside of space-time (Currivan 2017). A Vector Equilibrium is six pairs of vectors, six polarities holding the structure in balance. This is known as “tensional integrity”, or tensegrity (Edmondson, A 2009), as the tension manifests the form and the form holds the tension. This relates to the concept of the Seed and Potential arising at one and the same moment. It is a moment of conception at which point a seed planted in the material world is in resonance with its potential in the informational world, forming together an informational envelop within which that life form can crystallise out. It is literally a process of the integration of heaven and Earth, of in-formation, as potential inspires (“breathes into”) physical form and physical form draws down the information through its density and gravity so it can manifest in three-dimensional reality. This is precisely the process described geometrically by Marshall Lefferts during Cosmometry. When the unified field and Vector Equilibrium come into disequilibrium, a process is triggered in which a dynamic geometry is released in a process of continual enfolding and unfolding as it breathes into the core and out to the periphery, linking up all levels and densities of information, energy and matter. The density increases as the scale gets smaller towards the centre of the entity. As it enfolds and unfolds, the jitterbug passes through the geometric forms that make up the platonic solids, known to be the core geometries at the foundation of all life forms. The jitterbug dynamic literally links information and energetic potential with material form through its dynamic geometry. It is the creation process. 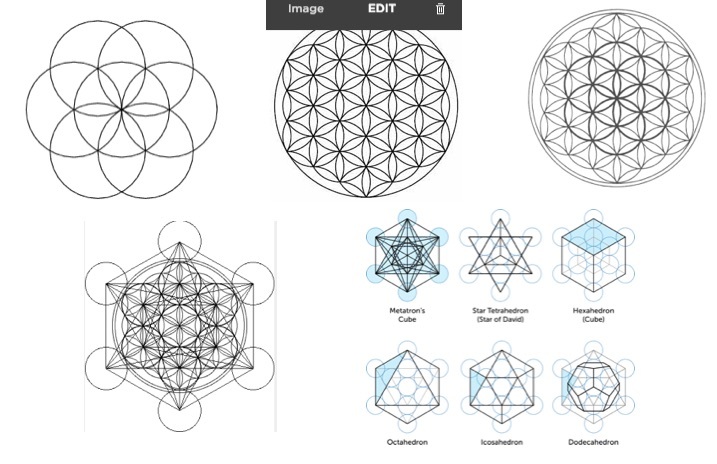 The concept of seed and flower / fruit to new life can also be seen geometrically through the forms that have become known as the seed of life, the flower of life and Metatron’s Cube. The six circles of the seed of life form the foundation for the expanded flower of life, which in itself forms the foundation for the three-dimensional Metatron’s Cube that contains within it all the platonic solids, the building blocks of life (Melchizedek 1990). Not only do we see the platonic solids in this process, but we also see how the phi proportion plays a key role in the relationships between the parts. Phi, also know as the “golden proportion”, is a number that describes the relationship between parts and wholes. It is a proportion that exists in most natural life forms as it is the most efficient way of vitalising parts whilst maintaining the coherence of the whole (Doczi 2005). Bateson (1979) notes that this is what enables a spiral to “retain its shape (i.e., its proportions) as it grows in one dimension by addition at the open end” (12). This once more demonstrates how the dynamic geometric process seems to reflect natural life dynamics. 1. Out of no-thing -- the cubeoctahedron or Vector Equilibrium (VE) (red. orange) an archimedean solid, emerges … with 12 rays from and to the center. All vectors or rays are equal in length. The VE is a direct expression of singularity. Explosion and implosion are in perfect balance. 2. Two tetrahedrons (platonic solids) (gold, silver), forming the Star-Tetrahedron (Merkaba) inside the hexahedron (cube) (platonic solid) (blue), rotating on its tip. 3. The octahedron (platonic solid) (magenta) touching with its corners the sides of the cube. 4. The rhombicubeoctahedron (green), an archimedean solid, connecting the VE with the Star-Tetrahedron. When the tetrahedrons are replaced with spheres and projected on to a 2D surface we get the "Flower of Life". 6. The icosahedron (platonic solid) (sky-blue) and the dodecahedron (platonic solid) (yellow) form an outer shell to complete what is known as "Metatron's Cube" in 3D. 7. Torus (silver) and Vector Equilibrium (gold) form the outer shield. Buckminster Fuller’s detailed description of the jitterbug process describes how all these aspects breathe and pulse together ensuring the continual interaction and distribution of information throughout all levels of the holographic system (Edmondson 2009, 179-193). McTaggart (2001, 26) describes how this process continually imprints the brane container or “field” with all the information from the system, creating what she calls the “Zero Point Field” and what Laszlo (2004) refers to as the “Akashic Field”. the informational patterns that underlie our Universe embody the minimum information and simplest instructions at all scales to enable manifestation of the maximum diversity and the development and evolution of the greatest complexity. There is compelling evidence that the torus I am describing is not a single torus, but actually a double-twisted torus (Haramein 2011, Anasazi 2012). The images in Figure 11 (Anasazi 2012) show in particular the top view of a magnetic field using ferrofluids where one can see a “doubly twisted magnetic field”, which fits with Howard Johnson’s discovery of two spinning vortices for magnetic fields. This relates to physicist Nassim Haramein’s double torus thesis (Haramein 2011). Haramein illustrates how the double torus dynamic can be seen in the way galaxies and black holes work. His description of how a particle flows through a double torus (Figure 12), shows it coming out at ninety degrees from the space where it is most contracted at the centre, backing up the thesis that the material world manifests at a ninety degree plane to the non-material (“The underlying informational field is embedded and embodied in so-called phase space.… The complex plane of phase space is geometrically 90° out of phase with the materialised world.” Laszlo & Currivan 2008, 57). For Haramein this explains how the Universe is seen to both expand and contract in parallel. The expansion is perceived on the outer surface of the torus, and the contraction happens at the centre. There is both a movement towards unity in the expansion and towards differentiation in the contraction. Elgin (1993) describes two attributes of a torus that also support the expansion andcontraction dynamic. A torus is both “dynamically closed (as self-organizing and self-bounding systems) and dynamically open (directly connecting with the Meta-Universe” (209). The self-referencing nature of the closure supports contraction and greater differentiation while the open connection enables continual expansion. Haramein also notes how in esoteric traditions the top and bottom chakras are portrayed as vortices bringing in energy from above and below and meeting at the heart - with the heart chakra being depicted as the star of David, or star tetrahedron. This is the same waythat Andeweg and the ECOintention practice depicts the integration of the conceptual and manifest energies. Andeweg (2016) relates this integration process to metatron’s cube as above, together with the Huna vision of a person and the Flower of Life. In his depiction (Figure 14), he also identifies the creative polarity between the Higher self of potential (what he also calls the “gate of appearance” as that is where the information appears in its quest to become form) and the seed of Deeper self, with the manifestation process happening in the space in between. His nine levels align with the volutionary octave as he has the central level as the heart, and in volution the heart sits between the two central phases of the octave. Another point of interest is how the double torus when seen from above reflects the Seed of Life symbol, containing the geometry of the platonic solids and proportions of life (Anastazi 2012). Anastazi also notes an important feature. Even though there is a vortex at each of the two poles, there is still a net flow of energy in one direction. From a volutionary perspective that could imply that the pole of Potential holds a greater pull than the Seed pole, reflecting the general directionality of increasing unity and differentiation, moving into an integration that transcends yet includes the parts. If the poles held each other in equal balance, there would be no dynamic or direction. In our brain a toroidal integration of phonon, photon and electron fluxes may guide information messengers such as Ca2+- ions to induce coherent oscillations in cellular macromolecules. The integration of such multiple informational processes is proposed to be organized in a fractal 4-D toroidal geometry, that is proposed to be instrumental in conscious perception. The toroidal form is caused by some initiating energy meeting resistance from another force that causes it to curl back upon itself into concentric circular sheaths or waves… The two great forces of centripetal and centrifugal motion create the tension that gives form to the formless. This toroidal dynamic of creative tension between the poles continues until “either the original impulse has been neutralized by the secondary energy (inertia) or the primary force is sufficiently strong enough to impose a new and greater rhythm on a lesser force or energy”. This would suggest that the life form and its torus continue to exist and evolve either until the seed has done all it can to express the potential or the potential has transformed the seed into something able to express more of life that it was originally designed for. It also suggests that life force is maintained through an ongoing relationship and creative tension between potential stored in informational fields (the Container) and physical reality (the Manifest). Currivan (2005, p. 215) notes the work of neurophysiologist Ralph Gerard who “has found that nerves throughout the human body are uniformly polarized; positive at the inputs fiber (or dendrite) and negative at the outputs fiber (or axon), guiding electrical impulses to move in one direction only and thus giving electromagnetic coherence to the nervous system.” Once more a natural system whose vitality and functioning is maintained by a polarity with input one end and output the other end. Hardy (2008) in her exploration of nonlocal resonance between people describes what she sees psychically in the field of activity. 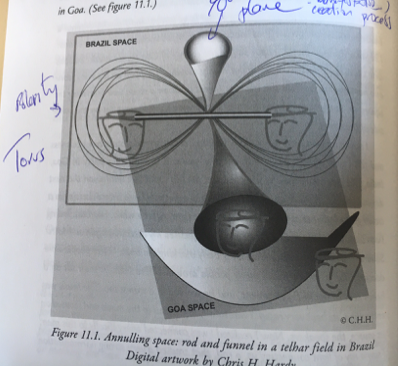 She calls these fields “Telhar fields (telepathic-harmonic fields)” (2) and creates an image of it that looks just like a torus with a ninety degree plane (see Figure 16). Figure 16. Chris Hardy’s depiction of the “Telhar field” during her nonlocal experience of a dance event in Goa. The nature of spin relates to the creative relationship between the centripetal potential force and the centrifugal seed force. There is a dynamic in the physical sciences called the “conservation of angular momentum” which says that as the periphery comes in closer to the axis, like a skater pulling their arms in, the entity speeds up, and vice-versa. The centripetal potential force brings the periphery in towards the centre, giving the entity density, shape and coherent form. The centrifugal force pushes out from centre, expressing itself in increasing uniqueness. A healthy life form has a good balance. If it is too internally directed centripetally then it doesn’t express its potential in the world, and if it is too dispersed in its centrifugal expression then it loses touch with its core purpose and its resonance and impact dissipate. Figure 17 shows the toroidal dynamic with the compression and expression of form at the centre, “a compression away from tenuity and formlessness into form and substance followed by expansion from substance back to tenuity and formlessness” (21). Figure 18 illustrates the same together with the parallel processes of compression (“Gravity”) and expansion (“Radiation”). This dynamic balance between the centripetal and centrifugal is what enables the flow of information through the system. Currivan (2005), Jahn & Dunne (2005) and Roney-Dougal (2010) all document the research that has been done on “presentiment”, that is the experience of knowing something before it actually seems to manifest in our three-dimensional visible world. Radin (2013: 108, 133-178) documents research showing how “the present is also influenced by the future”. What Currivan suggests is that rather than thinking of this phenomenon as somebody sensing the future, which is what it looks like if you take a linear time perspective on it, it is more adequate to see it as the person accessing the information that already exists in the information fields a relatively short time before it shows up in the gross physical realm (142-5). Bohm reinforces this: “When people dream of accidents correctly and do not take the plane or ship, it is not the actual future that they were seeing. It was merely something in the present which is intricate and moving toward making that future.” (quoted in Talbot 1991, 212). Abram (1996) backs up this perspective with his research into how Heidegger and Merleau-Ponty describe time. Heidegger, he says, “writes of the past and present as absences that by their very absence concern us, and so make themselves felt within the present” (212). He describes Merleau-Ponty’s position on our need to locate things in a past or future as “searching for certain invisible aspects of the visible environment, certain unseen regions whose very hiddenness somehow enables or makes possible the open visibility of the land around us” (212). For both of these philosophers, the past and future do not exist outside of the present but are aspects of it. This is an example of how the flow of information works in a toroidal system. Before information crystallises into denser form it exists in a less dense form and can be accessed by extending the ability of our awareness to be able to pick up information in more subtle stages. Our brain already does that unconsciously as Radin (2004) has demonstrated. Currivan (2017, 52) references an experiment by a team of physicists at the University of Geneva who demonstrated how the information that was present in a photon was actually preserved after the physical destruction of the photon itself - suggesting that information is connected to but not limited by the physical form it takes. She also references Michael Levin and colleagues at Tufts University who “have shown that Planaria flatworms aren’t just able to regenerate their heads, but when they do so they remember information they knew before decapitation” (156). The information supersedes the form (which also reinforces the case made in Chapter 2 for seeing the Soul as the information-holding brane field of an entity - the information exists outside of the time-space manifestation of the form). The flow of this holographic breath is between more dynamic potential and denser manifestation. The relative density of reality is related to the coherence of wave forms. Information expresses itself as energy-matter. As Currivan (2005) points out, “Physics has now equated matter with energy. The perceived separation of material objects has been replaced by energy fields, which incorporate harmonic patterns and waves.” (89). Matter forms through coherent waves of energy. 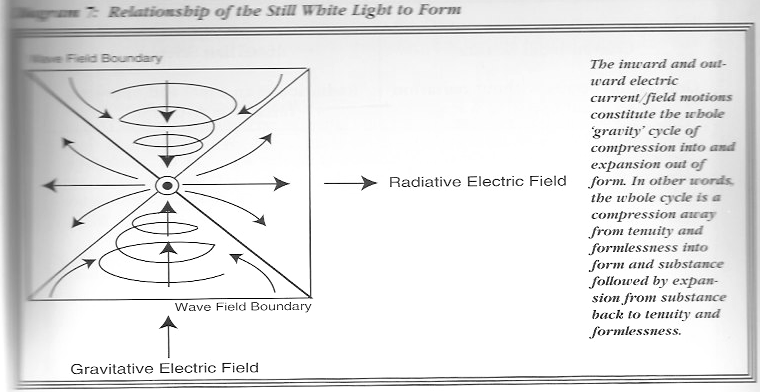 This positive interference of waves is what enables the holographic process as described above (94). Information streams through the torus-like entity expressing itself as energy in relatively dense or subtle forms, creating the holographic reality of all information always being present in each of the parts of the system. This last point is backed by research into memory which has been shown to exist throughout the brain like a hologram, not just in one part of the brain (Currivan 2005, 119). This points to the possibility that the individual’s inner experience in these perinatal phases is resonating at an archetypal level with experiences in our collective human field – and vice-versa. If indeed reality is fractal in this way, then as we transform our traumas at the individual level we could also be changing the patterns in the collective field. Grof asserts that without the inner transformation of the traumas we will not solve the equivalent problems in the world. Likewise, were we collectively to face up to the pain we cause each other and other life on this planet, as in the despair and empowerment work of Joanna Macy (1998), then we would be helping individuals to clear any trauma they had experienced in the perinatal phases. Next we look at how holographic patterns show up in this flow process. David Bohm (1980) coined the word holomovement to describe both the holographic nature of the Universe and its toroidal flow. as more and more analyses of human activities are investigated, it’s becoming increasingly clear that while arising from myriad individual decisions, our group and collective conducts embody exactly the same holographic signatures as are exhibited throughout the so-called “natural” world. Recent scientific studies are also pointing towards a holographic design of the Universe. A study by the University of Southampton (2017), together with three other universities, “has provided what researchers believe is the first observational evidence that our Universe could be a vast and complex hologram”. To summarise this section: I have been looking at the dynamics of the flow between the two poles of seed and potential that create the container for something to express itself in life. I proposed that those dynamics are holographic and toroidal in nature, that the container field resembles a membrane that holds information and expands, that there is a geometry to the torus and that the toroidal dynamic is like a breath with a continual flow between denser and subtle energetic expressions of information. The holographic nature of the Universe leads to similar patterns showing up across all expressions of life. In the following section I will look at how the poles grow towards each other, the subtle interpenetrating the gross and vice-versa, and how this is a process of an entity becoming increasingly whole and conscious of itself, until it reaches full fruition.